17 birthday themed stamps. Balloons, cake, champagne glasses with banner, candles, streamer and more. Sizes range from 2 1/4" to 1/2". 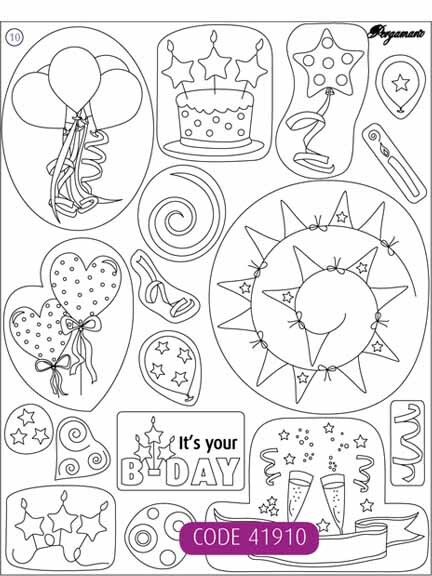 With the versatile clear stamps you can easily add a nice image onto parchment paper! The stamps are transparent so that you can see exactly where you want to stamp the image on the paper. This makes it also suitable to stamp images next to each other or even overlapping each other. These versatile clear stamps easily add a nice image onto parchment paper. These images can be stamped onto vellum, parchment or cardstock paper. The images are easy to colour with perga liners (21452), dorso crayons (21443 and 21444) and stencil pastels (21460 and 21461). You can experiment with glitter and gilding flakes using double sided tape or the cosmic shimmer glue. By embossing certain areas of the stamped image you can create a beautiful depth effect.